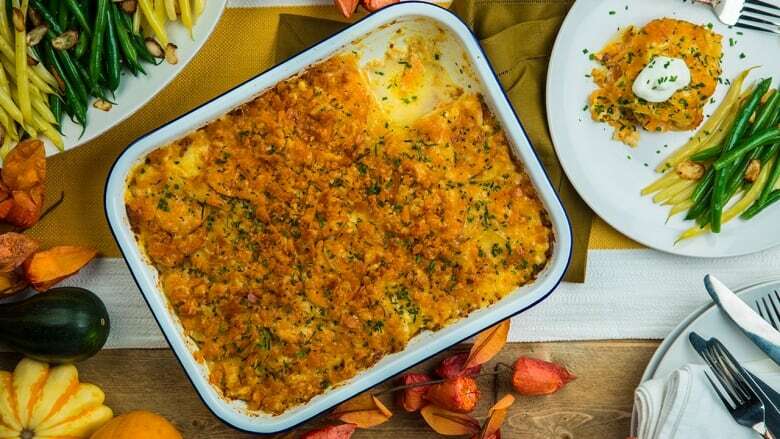 A cheesy casserole that's perfect for any feast! This crunchy potato casserole is the ultimate comfort food. It's easy to make and its cheesy goodness makes it a delicious dish to bring to any potluck. It's also a perfect accompaniment to a Thanksgiving turkey, and is bound to be a hit at your next family feast! Whisk cream, nutmeg and thyme together in a large bowl. Using a mandoline or a sharp knife, slice all potatoes into 2mm slices, leaving the skin on. Transfer to your bowl of cream, toss and let soak for at least a minute or two. Layer your sliced Yukon Gold and sweet potatoes in a generously buttered 9 ½ by 12 inch baking dish. Make sure to mix up potato slices when you're layering to achieve a nice design. Using two cups of cheese, alternate layers of potatoes and cheese and season each layer with salt and pepper. Your last layer should be only potatoes. Pour the remaining cream mixture over your top layer — it will soak through when cooking. Bake at 375F for 1 hour 30 minutes or until potatoes are tender when pierced with a knife. To finish, mix the remaining cheese with crushed crackers and melted butter. Sprinkle on top of the potatoes and broil for 3-5 minutes until melted and crispy. To garnish, sprinkle with minced chives and serve with sour cream, enjoy!